I recently finished (as in, last night) The Hunger Games by Suzanne Collins and I loved it so much that I immediately started reading the second book in the series, entitled Catching Fire. I don’t want to say too much about the plot of the book because I don’t want to ruin it for anyone who has yet to read these novels. At the end of the first novel, I must admit, I had trouble imagining how the second novel could compare and where Collins would be able to take the characters and plot when the first book ended. I realized, quickly, that my concerns were for absolutely no good reason! In Catching Fire, it turns out that the actions of the main character in the first book (Katniss and Peeta) have begun to spark the seed of revolution throughout the 12 Areas of this post-apocalyptic world. In the first novel, it is obvious that, while those who live in Capitol (the hub of this world) want for nothing, those who live in the 12 Areas struggle for all the basic elements of their daily lives. As a result of the actons of Katniss and Peeta during the Hunger Games in the previous year, people begin to rise up throughout the various areas. And, as a means of dealing with the prospects of a full-fledged rebellion, the powers that be in the Capitol decide to design a very special Hunger Games that they feel will help them to continue their hold over the people and use fear to keep a rebellion at bay. I was wrong to doubt that, as a second book in the series, Catching Fire would be as well-written and riveting as the original. Like the first novel, this book has well-developed characters, an interesting plot and a lot of action and suspense. I kept putting the book down to go and do other things, only to find myself coming back and picking it up again because I wanted to read “just a little more”. I ended up finishing this book in one day because it was so engaging! I also appreciated the fact that there was enough information provided that I could have read the second book without reading the first, but it was balanced in such a way that I didn’t feel like I was simply rereading elements of the first book that I already understood. 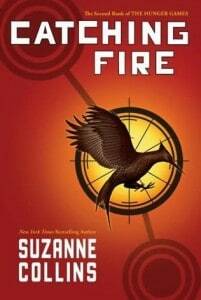 I would thoroughly, and whole-heartedly, recommend Catching Fire by Suzanne Collins! Personally, I would suggested that you read The Hunger Gamesfirst, but only because I think it will add to the enjoyment of Catching Fire! I can’t wait to read Mockingjay (the third book in this trilogy) when it comes out later in August! I also found myself checking out Suzanne Collins’ website because I think she is an amazing writer and I’d like to check out some of her other novels as well! OMG! I love these books, I am waiting to get the third one from my sister! I won a copy of this book and like you, read it the same day I opened the parcel. I was so hooked I went out and bought the Hunger Games in Hardback(!!! ), and read that in one day too. Then I eagerly awaited Mockingjay, which I can promise you is a really great conclusion to the series. I really didn’t know where the author was going to go with Catching Fire either. I didn’t think that it could get any better than The Hunger Games! I absolutely loved Catching Fire, however Mockingjay definitely WAS NOT my favorite. It was just too sad!